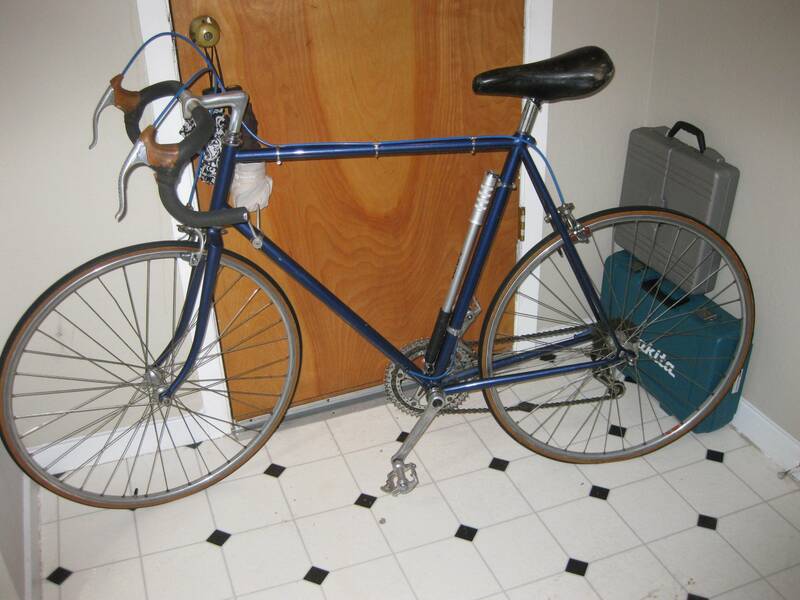 According to a fellow on craigslist this is a cinelli. From the pictures all I can see is that it has Campy hubs, Sugino Mighty crankset? If anything how about some help ID'ing this frame? Last edited by omgar; 10-02-11 at 03:10 PM. Any chance of the seller providing you with more detailed photos? Oh, and those might be Campy 1010a long dropouts at the rear. I don't think the bicycle is a Cinelli. More likely a mid level eighties something bicycle from Japan's bicycle machine, would be my guess. Well, from what I see it's not lugged which is sort of a turn off for me. Here are the rest of the pictures the seller provided. Not much to work with but it's something. + 1 on the parts. 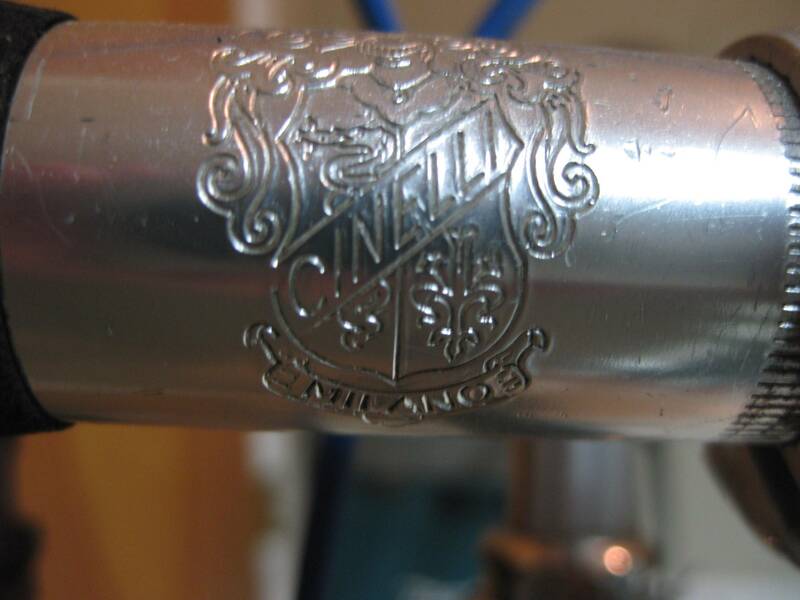 Your newest pics show a first-generation Cinelli 1A stem with the oval "Milano" engraving and those appear to be early Campione del Mondo or Giro d'Italia bars. A nicely fillet-brazed frame is nothing to sneeze at, BTW. A lot of handwork goes into building one of those. This might be a custom and worth some outlay in that case. I love those platform pedals. She replies rather quickly by email which is how I got the pictures. Last edited by devinfan; 10-02-11 at 04:42 PM. ^ +1 on this. It certainly is worth $200 and it would be fun to try to find out what it is/who built it. Interesting to note what appears to be two different treatments to the cable routing over the BB shell: front derailleur guide looks to be the split type, which runs a housing between two stops, while the rear guide is of the Campagnolo type that simply guides the exposed gear cable. I love the paint... and the transitions from the stays to the rear dropout. I'm calling it - I think this one's something special. Someone buy it so I can find out if I'm right! ^ What are you waiting for DF? Looks English to me. Maybe a Mercian, or something along those lines? I have a new system. I am going to put a toonie (a $2 coin here in Canada) away every day, and at the end of the year that would give me a sunstantial amount to play with. Until then I can just enjoy looking at other people's bikes! Well, I've seen this in person and can tell you: you're right...and you're wrong. 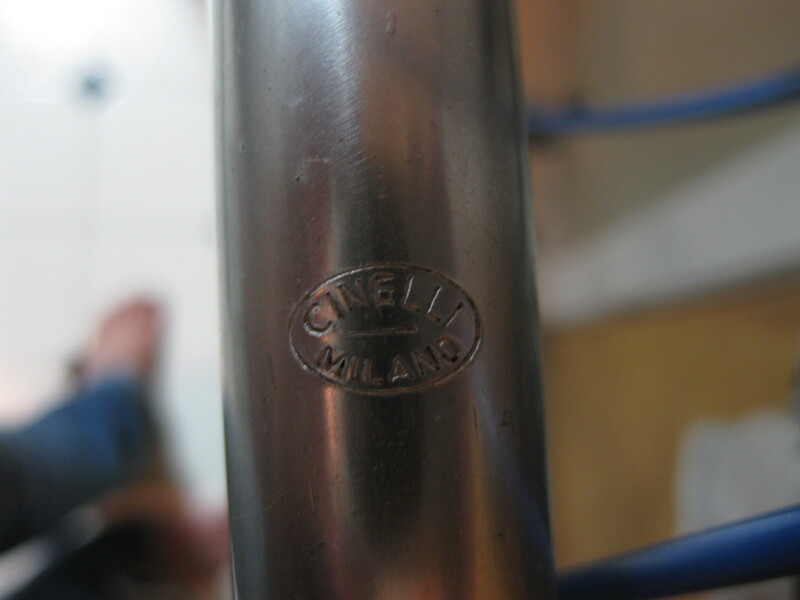 It's not a Cinelli (obvious), but what it is is a mystery. a 68mm BB shell BUT Italian threading (and it's a Sugino BB) weird! 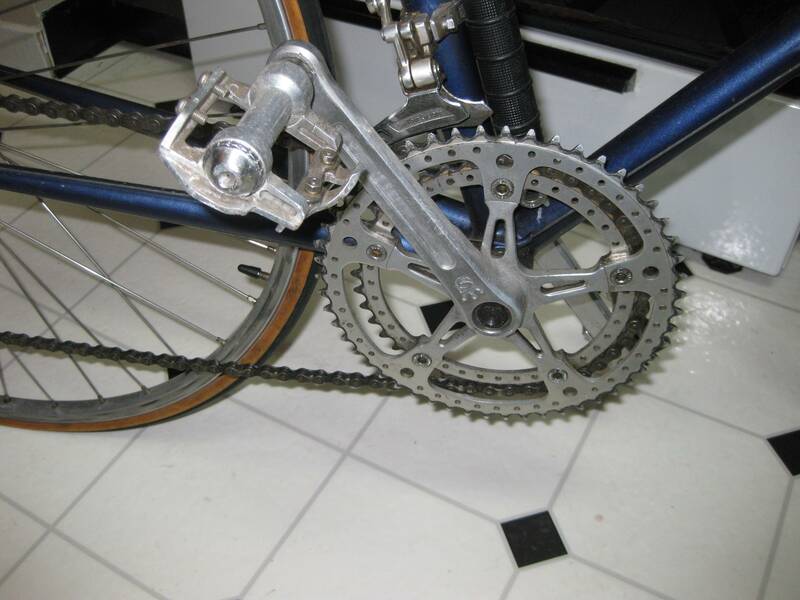 And there's more: nutted brakes and 120mm rear (5-speed) does point to a late '70s vintage, the date on the Sugino Mighty crank is '75, the wheels are Campy hubs (I'd say Gran Sport, not Nuovo Record) on Rigida clincher rims, 700C. Couldn't tell what size seatpost, but there appears to be a brazed-in shim in the seat tube (ala Cinelli, but that's not saying this is one) so I'm betting it's not 27.2. Saddle is toast, but was something like a Unicantor. Brakes are early DuraAce...FW might be a Regina, but couldn't tell. My gut says it's a British (possibly American) Custom and well made, but...weird! Columbus(?) tubing and Italian BB shell, but everything else smells very Brit or British-influenced. Last edited by unworthy1; 10-06-11 at 12:46 AM. Funny, that dropout treatment is precisely what says "not that special" to me - though they're certainly "OK."
^Right^ those "domed" ends are right out of the box, just how Reynolds supplied them. However, was that how Columbus supplied theirs? I'm still wondering if this has all Columbus tubing (matching the steerer) or if it's a mixed set (or a replacement fork). and, upon strip-down it's even weirder: anybody know what builder besides Pino Morini liked to drill about 20 holes in a steerer? Pics will follow, but later. Congrats on picking it up, unworthy1! I can't wait to find out more about it. I guess I don't know much about dropout treatments, it sure looks like nice work to me. only thing stamped here is the number 58 which corresponds to the size. anybody know what brand this dropout? Serial number is 000387 and then BK, pretty "jumpy" stamping. Also, the headset is a make I've never seen: very clean and simple chromed steel, still in good condition, no flats for a wrench on it at all...no markings either. It looks "British" but no brand I'm familiar with, nothing in Velobase that looks like it. Will post pics of that tomorrow. Last edited by unworthy1; 10-06-11 at 07:18 PM. 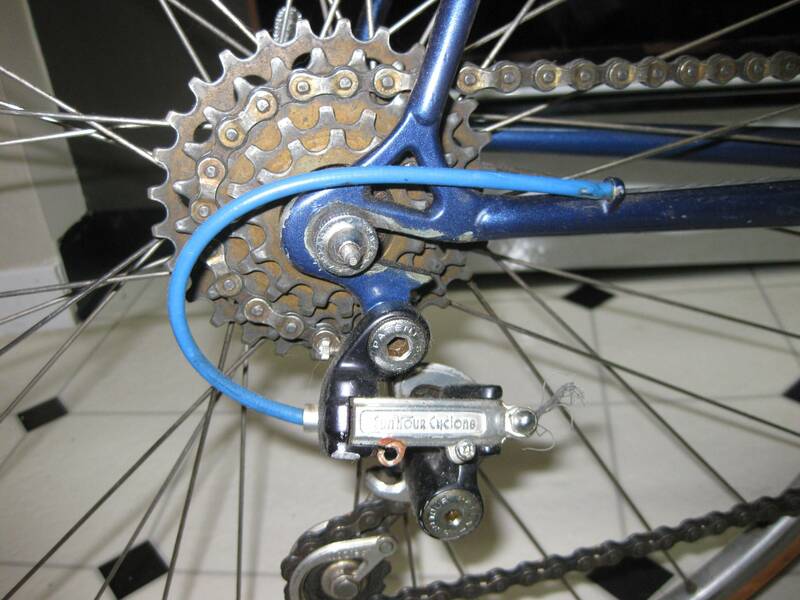 Viscount used nice long "no named" dropouts on their bikes. English, too.